Liz Glynn’s exhibit “Open House” installed on the Commonwealth Avenue Mall. “Nothing gold can stay,” wrote Robert Frost. Golden sunsets fade. Blond hair grays. And gilded ages end, corroding like cheap metal left outside too long. What remains when the gilding falls away? What do the ruins of an opulent epoch look like? 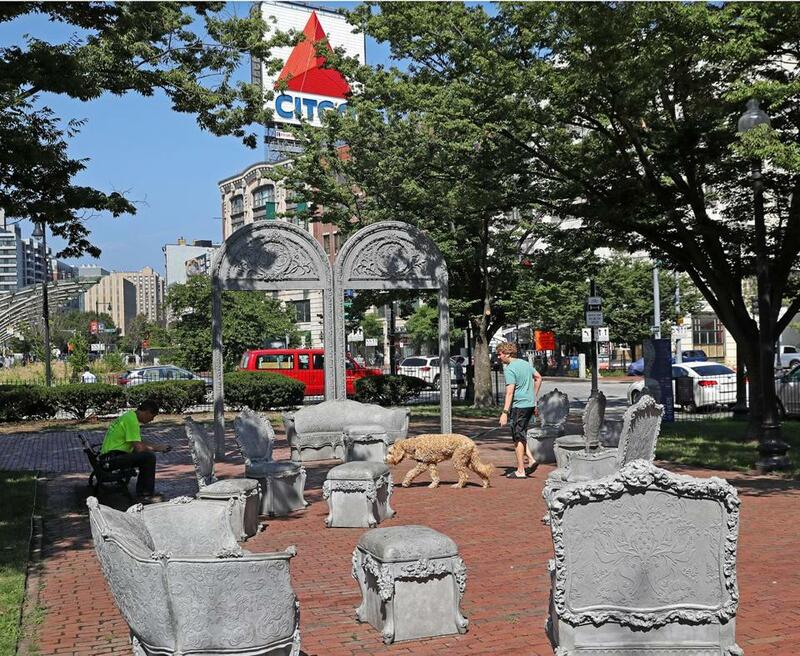 Liz Glynn gives a glimpse in a new public art installation on the Commonwealth Avenue Mall, between Kenmore Street and Charlesgate West. The exhibit, “Open House,” resembles the interior of a lavish 19th-century ballroom, with Louis XIV chairs, ornate sofas, footstools, and tall semicircular arches. The pieces aren’t authentic. They’re concrete replicas, gray and somber, as though once frozen in ice. Enjoyed by the upper echelon of New York society during its life, Whitney’s ballroom will now be revived for the Boston multitudes. The exhibit is open to the public until Nov. 4, and visitors are invited to sit on the furniture. The 26 pieces — visually attractive and stone-hard — have the look of sculpted clay, with an overcast hue and naturalistic floral motifs. They’re parts of a pared-down setting no longer reserved for the rarefied. Gilbert added that Now + There hopes to hold live performances at the site, as well as talks on arts and urban issues at other locations in the city. Glynn also has an exhibit on display at the Massachusetts Museum of Contemporary Art. “The Archaeology of Another Possible Future,” which occupies more than 25,000 square feet at the museum’s Building 5 gallery, examines how the abstraction of economic production threatens to alienate and imperil humankind.